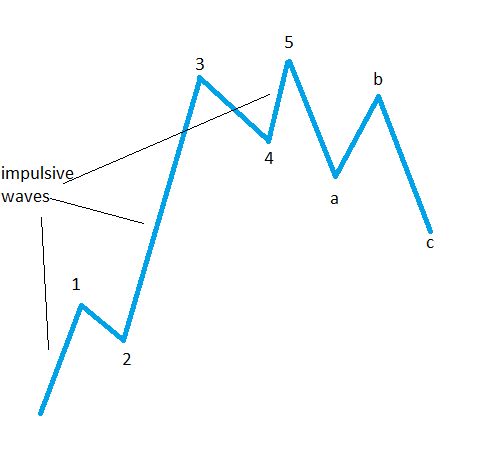 An impulsive wave is a five-wave structure labelled with numbers (1-2-3-4-5), and it is the move every trader wants to catch. The reason for this is that in an impulsive wave price is supposed to move faster than in a corrective wave. In this section of the Forex Trading Academy dedicated to the Elliott Waves Theory, you’ll find out that that is a wrong approach to understanding impulsive waves; not only because impulsive waves are complex structures, but, at least when it comes to the Forex market, because they are not that common. Yes, this market that trades more than 5 trillion dollars on every business day is spending more time in consolidation areas or ranges than travelling in impulsive waves. However, consolidation areas or corrective waves also have impulsive waves of a lower degree in their make-up. By way of example, a complex correction like a triple zigzag pattern has no more and no less than six impulsive waves of a lower degree in its make-up. This makes it one of the most vicious and powerful ways in which a market can move, and almost all Elliott traders associate it with an impulsive wave; but this is totally wrong. In order for a move to be interpreted as an impulsive wave, it needs to follow specific rules for each and every one of those five waves, as well as rules and conditions for the overall impulsive wave. Moreover, even price action to follow an impulsive wave needs to obey other rules that basically confirm the previous impulsive wave. If the rules for the move to follow an impulsive wave are not respected, then the previous impulsive move is simply not correct. What Makes an Impulsive Wave? There are many factors and conditions to look at before deciding whether a move is an impulsive wave or a five-wave structure. Only if that respective decline or advance in the market respects all impulsive rules can one say for sure that the count is correct. One thing that traders fail to realise is that counting waves with this trading theory involves interpreting future market moves based on previous patterns/conditions/price action in the past. Counting should not be done with current price levels, but rather current price levels should be a reaction of previous counts on the same timeframe, or longer ones. The following are rules that define an impulsive wave, and any move that respects them is a valid Elliott Waves five-wave structure. They should be interpreted together as part of what makes an impulsive or a motive wave, and if even one is not respected, then the whole interpretation falls apart. The First, Third and Fifth Waves Are Impulsive. In any five-wave structure, the first wave is an impulsive wave in its own right. This means that all the rules of an impulsive wave that are valid for the overall structure should be respected by the first wave as well. The only difference is that this first wave is of a lower degree or a different cycle. For example, if the higher-degree impulsive wave is expected to form on the monthly chart, then the first wave will form a five-wave structure of a lower degree that is visible on the shorter timeframes, such as the weekly and daily ones. The same thing applies to the other motive waves in a five-wave structure, namely the third and the fifth ones. Taken separately, they need to be impulsive waves in their own right; together, they are part of an impulsive wave of a higher degree. This is by far the most important rule of them all in an impulsive wave, and it totally validates or invalidates a count. Such a rule cannot be bent or ignored, and it has the great advantage that it is visible in any five-wave structure. 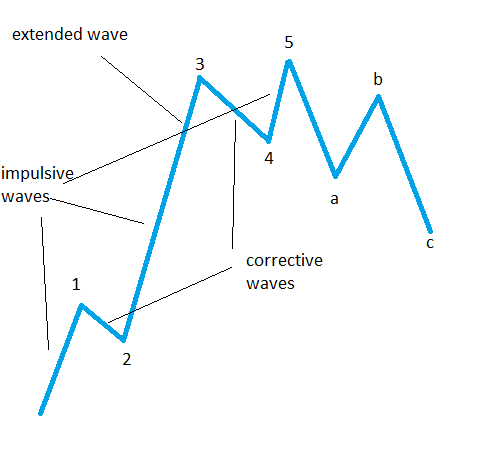 What I’m trying to say here is that even before starting to label a possible impulsive wave, if the potential third wave is the shortest one when compared with the first and the fifth waves, then the whole pattern is not an impulsive one; it most likely falls into the corrective waves category, and more investigation needs to be done in order to come out with the proper count. One Wave Needs to be Extended. Out of the three waves that need to be impulsive in a five-wave structure (the first, the third and the fifth), at least one needs to be extended. Extension refers to the longest wave out of these three, and it strongly related to Fibonacci levels. Actually, the overall Elliott Waves theory would be meaningless if there were no Fibonacci levels involved. (More on this on future articles.) As a rule of thumb, a wave is considered to be extended if it is bigger than 161.8% when compared with the other two waves. Such a wave is usually the third wave, but first- and fifth-wave extended impulsive waves are also common. In any 1-2-3-4-5 labelling, the second and fourth waves are considered to be corrective waves: The second wave is the reaction to the first wave, and the fourth wave is the corresponding reaction to the third wave. A very good question here would be: What is the market reaction to the fifth wave in an impulsive move? The answer to that question comes from the reaction the market has to the overall 1-2-3-4-5 impulsive wave, and it is of a larger degree than the reaction for the first and second waves. Nevertheless, all are corrective waves. Both the second and fourth waves correct into the territory of the first and the third wave, and the retracement level is different. The second wave cannot retrace beyond the start of the first wave, and the fourth wave cannot retrace into the territory of the second wave. Usually, the second and fourth waves are different in many aspects, such as structure, distance travelled, complexity, etc. By now, already, Elliott Waves theory doesn’t look that simple anymore. So many things to consider just on an impulsive wave structure? Well, these are only basic things, as impulsive waves come in different types (no less than four! ), and this subdivision further complicates the overall analytical thinking when labelling markets.